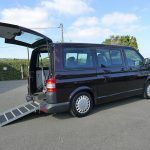 A wheelchair accessible vehicle that can accommodate up to seven people including the wheelchair user! 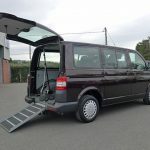 A Lewis Reed conversion with many adaptations all designed to make this a very attractive proposition for a wheelchair user, it even has a lowering suspension! 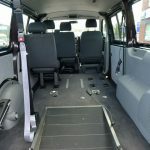 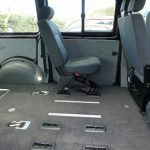 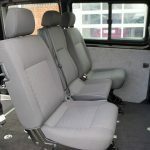 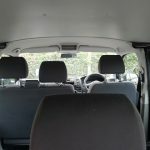 Take a look around the photographs we have included on this page and you will see that the van has been adapted with the choice of two wheelchair locations – either in the back behind the three seats should these be required for other passengers – so great for family use; or in the forward position just behind the front seats as the rear seats are all removable (we have posted a photo with two removed as an example of this) – Very adaptable indeed. 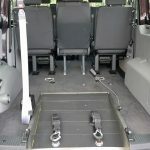 The one piece, TorSpring ramp (unique to Lewis Reed) is very lightweight and very easy to lift up and down. 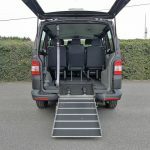 Once the wheelchair user is ready to board the vehicle, the rear suspension can be lowered making it easier to push the wheelchair user up and into the back. 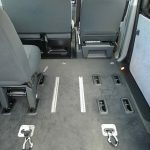 The great thing about a Transporter is the eyeline view which is excellent so all passengers can enjoy taking in the scenery when out and about. 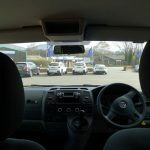 Air conditioning is also featured and great to have when the weather is warmer to keep everyone nice and cool (remember Summer of 2018!). 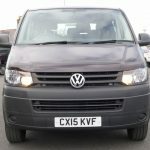 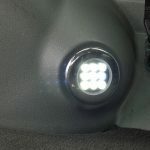 Some ‘nice to have’ extras come with this WAV including parking sensors, a side step plus some LED lights located in the wheel cover inside making it easier to see in poor light/late in the day. 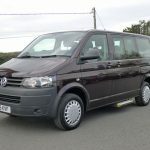 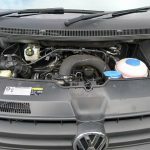 The 2 litre diesel engine on this Volkswagen give this WAV plenty of power and what a lovely finish it has too – blackberry! 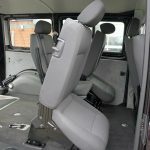 A full list of features is included in the specification section on this webpage. 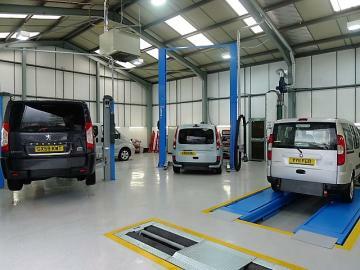 All of our quality mobility vehicles come with 12 months MOT, 12 months warranty and are serviced and valeted in our very own Service Department. 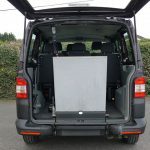 Our friendly drivers will provide you with a full demonstration of how the adaptations work upon arrival and we deliver straight to your door (UK Mainland addresses only).